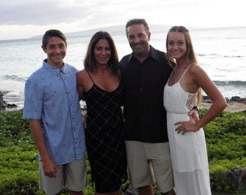 Dr. James Reiley, Aliso Viejo Chiropractor, and his family. What’s the best way to choose a chiropractor in Aliso Viejo? You’re doing it! Spend some time here exploring our chiropractic philosophy and our patients-centered focus. Dr. James Reiley’s desire to pursue a career in chiropractic came from his love for life and healthy activities. Since 1996, Dr. Reiley has developed a family practice and emphasizes the need to look at each patient as a special, unique, whole individual. His love for sports has allowed him to work alongside competitive and recreational athletes. He has the opportunity to help these athletes minimize injury while achieving optimal performance. After you tour our website designed for Aliso Viejo-area residents searching for a chiropractor, give our Aliso Viejo chiropractic office a call. We’d love to meet you and explain our unique approach to today’s chiropractic. I had never been to a chiropractor, and was a little skeptical… But when I left Family & Sports Chiropractic I was no longer in pain! Never again will I ignore the dull ache in my lower back. The walk-in adjustment hours make it so easy and convenient! Thank you! M.H. Raise your optimum health and wellness at Family & Sports Chiropractic. Offering the finest chiropractic care for Aliso Viejo, Laguna Hills, Laguna Beach & Laguna Niguel. Staff were extremely helpful and friendly and my experience so far has been fantastic. Jason and I are so happy that Kristen referred us and we decided to come see Dr. Riley. We are both feeling so much better already! Thank you, thank you! Looking forward to many years of chiropractic treatment. I feel great after my first adjustment! I am excited to start this journey to better health and wellness. Thank you! Thank you Dr. Reiley for helping me with my pain, and for being as wonderful as you are. You are the best chiropractor that I know. God bless you always. Excellent staff and very committed to solving my sports related back issue! Nice, helpful staff. Dr Reiley explained things well and was very thorough. I’m confident I’ll start feeling better soon. Thanks for taking me in. The pain in my lower back has gone away. Excellent service and a great and friendly atmosphere! Great service very nice staff.